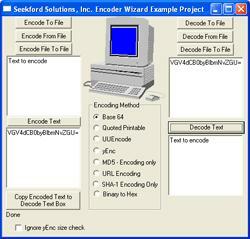 Encoder Wizard is a collection of two ActiveX (ocx) controls, Encoder Wizard and Decoder Wizard. These two controls allow you to fully support the Base64, Quoted- Printable, UUEncode, yEnc, MD5, HMAC MD5, URL, SHA-1, and Binary 2 Hex encoding methods. You can Encode and Decode data quickly and intelligently. Base 64 is the Encoding Method usually used for Binary files in MIME messages. It is also used to encode data for special characters accross telnet connection to certain servers. 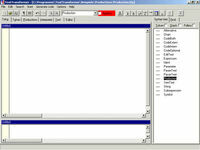 Quoted-Printable is used to encode text for transmission accross certain mail servers. 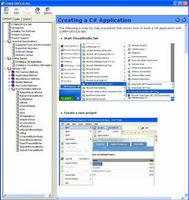 It is also commonly used in MIME messages. UUEncode is the data encoding mechanism used by Unix systems for encapsulating binary data so that it can transported safely accross network connections. yEnc is a recently created encoding method that is now used a lot in newsgroups since it is significantly more efficient for data storage than the UUEncode format. yEnc takes advantage of being able to use 8 bit encoding as opposed to the more restricted form of 7bit encoding used by UUEncode. MD5 is a message digest hash algorithm that is used for validation and verification of message integrity. 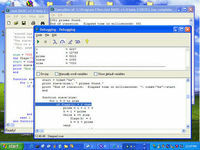 It creates a highly unique 16 byte ( 128 bit ) digest from a set of data that is almost impossible to recreate without the same exact input data. HMAC MD5 is also supported. This allows for a " keyed" hash algorithm. The hash will only generate the same value when the data and key are the same. Great for integrity checks and secure hash generation. SHA-1 is another highly secure message digest algorithm used by the United States Government. It is now a publicly open algorithm which uses a 160 bit or 20 byte digest. The hash from any set of data less than 2^64 bytes in length provides a unique hash that is only creatable by the unique byte order.